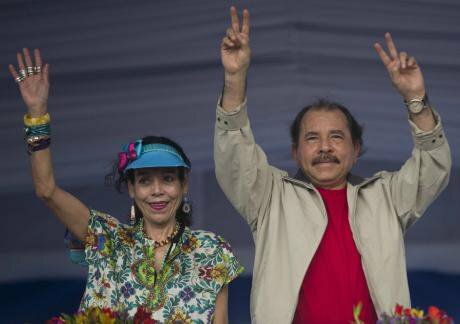 Nicaragua's President Daniel Ortega, right, and first lady Rosario Murillo, wave to supporters during an event commemorating the 36th anniversary of the Sandinista National Liberation Front. AP Photo/Esteban Felix. All rights reserved. Daniel Ortega, a Commander during the Sandinista revolution that overthrew a 50-year dynastic dictatorship, will hold office for a third consecutive term after being proclaimed the winner of Nicaragua's presidential election on 6 November. Ortega appointed Rosario Murillo, First Lady and manager of governmental communications, as his running mate and, by this move, ensured the concentration of power in his family's hands. For the past two terms of the Ortega administration, the separation of powers, respect for human rights and freedom of the press have steadily deteriorated in a worrying repetition of history. The electoral process on 6 November was characterised by massive abstention, the absence of major opposition parties from the ballot and a ban on independent international observers. The groundwork was laid well in advance when, in June of the same year, the Supreme Court of Justice ousted 16 congressmen and 12 alternates from the major opposition party. Amongst them, the Court removed the leader of the opposition and appointed another congressman in his place - the latter deemed more amenable to the governing party. Against this background, human rights defenders are struggling to preserve civil society space and to draw the attention of the international community to an increasingly authoritarian government. Francisca Ramírez has first hand experience of the repressive nature of the regime: she has been intimidated and arbitrarily detained and her family members were violently attacked in retaliation for her activism. Ramírez is a land and environmental rights defender leading the civil society movement opposing the construction of a transoceanic canal financed by the Hong Kong based HKND Group. In the rural community of La Fonseca, Nueva Guinea - where Ramírez is from - people have risen up against the threat of forced eviction and destitution that the transoceanic canal represents. “In my community”, says Ramírez, “we are two thousand and we are well organised”. During our conversation, the human rights defender describes being accosted and intimidated by sympathisers of the ruling party and local government representatives, who she fears are now emboldened by the re-election of Ortega. “The government, the police and the army… they all say we are criminals, they accuse me of being a drug dealer” recounts Ramirez. The backlash against the environmental and land rights movement opposing the construction of the canal has worsened as a result of reforms that have concentrated power in the hands of the President. Chiefly amongst them is Law 288, a reform of the National Police force decried by major human rights organisations. The law makes the President the highest authority for the National Police and renders several appointments within the institution a discretionary choice of the President. The 2014 reform of the Army also gave way for soldiers to take part in domestic policing, thus amending the Constitution to allow for the the militarisation of law enforcement. In addition to the repressive nature of the government, Ramírez is fighting back against the propaganda and efforts to misinform citizens. The latter seems to be one of the biggest challenges when denouncing human rights violations and mobilising fellow countrymen and women against them. “For a long time, the government has been dedicated to misinforming people, people are unaware of their rights”, says the campesino leader, “they think we are infringing on the government’s rights every time we march!”. Ramírez is also well aware that the odds are stacked against her in the media, an industry where the Presidential family has acquired substantial assets over the past five years. “A news media outlet is always ready to contradict everything I say”, claims the defender. On the other side of the country, where coffee plantations have dominated the hills for centuries, Marellyn Somarriba of the Red de las Mujeres del Norte (Network of Northern Women) confirms Ramírez assertions. “One of the strategies of the government is to promote itself” says Somarriba, “all the attention is focused in the government’s [social] programmes”. Somarriba fears that the re-election will bring more threats - and a higher likelihood that these will materialise -, more criminalisation and further narrowing of civil society space, “the harassment and the smear campaigns are becoming more sophisticated”, she contends. The women’s rights defender knows this possibility is all too real, as another feminist organisation she is involved in - Las Venancias - was falsely accused of financial mismanagement in 2008, allowing the State to open an invasive investigation and delegitimise the defenders. As negative as this form of judicial harassment might be, the limitations imposed on the work of the organisations by restrictive legislation is at least equally prejudicial. Somarriba describes the 2014 implementation regulations imposed for the Integral Law to counter Violence against Women (Law 779) as a substantive limitation to her activities. The law that was initially seen as a triumph for feminist organisations was later amended by a Presidential decree that curtailed defenders' ability to physically accompany survivors of gender-based violence as they appear before different governmental institutions in their pursuit of justice. Lottie Cunningham Wren is a land rights defender and a defender of the rights of indigenous peoples. As the founder of the Center for Justice and Human Rights of the Atlantic Coast of Nicaragua (CEJUDHCAN) and a leading human rights lawyer, Cunningham has been an effective advocate for her people. Most notably, she contributed as an expert witness to the Awas Tingni vs Nicaragua case heard by the Inter-American Court on Human Rights, a turning point in favour of the land rights of indigenous peoples in the Americas. CEJUDHCAN’s staff has faced considerable backlash because of their activism in favour of demarcating and titling the lands of indigenous peoples, including attacks, death threats and intimidatory phone calls. “The participation of indigenous peoples in the electoral process is practically inexistent”, states Wren, “we are constantly faced with obstacles to exercise our rights as citizens”. Wren is looking to strengthen her movement by building alliances countrywide with other defenders, consolidating existing monitoring mechanisms to track human rights violations and combat the isolation of indigenous defenders in the Atlantic coast. “As indigenous peoples, we face many challenges and obstacles within a system that does not allow for dialogue, which is more reason for us to continue the struggle for social justice and to open up spaces [for civil society]” says Wren. When asked what they need to persevere in their struggle, all three defenders - who come from different socio-economic backgrounds, operate in completely different geographical areas and work to promote different rights - all voice exactly the same request: space. This space needed for civil society, for exercising their right to express their concerns, to advocate for change, to peacefully demonstrate in the streets of their cities and create organisations that will represent the interests of their communities. As Somarriba describes, spaces for coordination between non-partisan civil society organisations and the State are also quickly vanishing. Human rights defenders in Nicaragua decry the absence or insufficient condemnation from the international community towards the repression they face and the deterioration of the rule of law in the country. Somarriba describes a feeling of abandonment when, despite the upsets, international experts have rarely visited the country to meet defenders locally, in order to shed light on the human rights situation. To add to Somarriba's concerns, the government has made it increasingly difficult for international human rights organisations to enter the country to monitor, document and visibilise the situation, having deported several activists in the past year. This year, Nicaraguans commemorated - in a bittersweet atmosphere - the 37th anniversary of the revolution that overthrew the Somoza dictatorship. This annual celebration commemorates a generation's struggle and is a tribute to those who died in the conflict. In the north of the country, however, the threat of armed conflict remains present. For centuries, this mountainous area has been a hide out for rebel groups. After the revolution, it sheltered members of the Contra, an armed group funded by the US government that opposed Sandinista rule and perpetrated acts of sabotage and atrocities against the civilian population. Somarriba tells me one of her major concerns is that as the grip of the current regime tightens, armed groups could resurface. Already, she points to acts of sabotage and skirmishes with army and police leaving several dead in small northern towns. The bodies are then presented as trophies of the war against organised crime, but Somarriba denounces these tactics as a way of covering up armed opposition to the government. Nicaraguan defenders are struggling to preserve vital civil society space where values of equality and human dignity are upheld above the personalisation of power and ubiquitous clientelism. The country is at a turning point where it might head for a one-party State. The question is whether this time the international community is ready to support those who are using peaceful means to counter increasing authoritarianism and ensure respect for human rights.